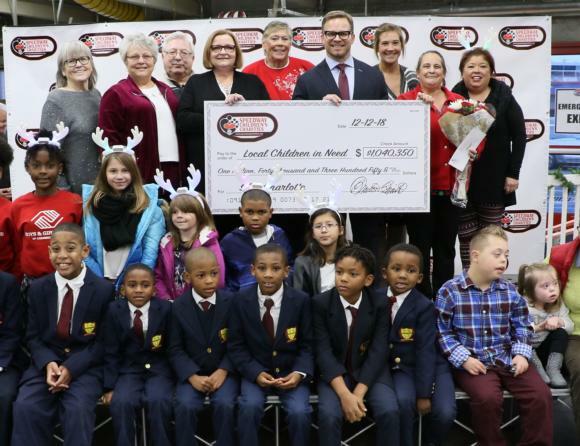 Speedway Children’s Charities (SCC), in a special grant distribution ceremony on Wednesday, announced that the nonprofit’s Charlotte Motor Speedway chapter distributed $1,040,350 in grants – a record annual amount – to 100 charitable organizations located throughout the Charlotte region. More than 250 children were joined by Santa Claus and Lug Nut, the world’s fastest mascot, for the grant reception in the Speedway Christmas presented by Disconnect & Drive infield village at Charlotte Motor Speedway. The Charlotte chapter’s 2018 contributions represent a sizable increase of more than $88,000 from last year’s mark. Since its inception in 1982, the Speedway Children’s Charities Charlotte chapter has raised more than $13 million through a variety of annual fundraising events to support children with everything from educational support to the basic need of a coat or meal. The Charlotte chapter of SCC is one of eight that are located at each of the Speedway Motorsports, Inc. (SMI) racing facilities. Over the years, SCC has awarded in excess of $55.3 million to nonprofit organizations throughout the nation. For more information on Speedway Children’s Charities or to learn how to volunteer or donate, visit www.speedwaycharities.org.